After Liliha Bakery, our hosts with Hawaii Food Tours took us to central Chinatown for a nice sampling of the various food establishments there. Probably the high point of the visit was them taking us to a fairly subtle store front on the Kekaulike Market: the Ying Leong Look Funn Factory, for a look at making fresh rice noodles. Walking inside, it’s less like walking into a store than, well, a factory, and you pretty much walk right into the noodle production line. They are making fresh funn, the wide sheets of glutinous rice flour noodles that are one of my favorite noodles from Chinese cooking. 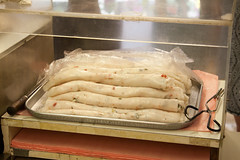 When fresh, these are always wonderfully toothsome, stretchy, and tender all at the same time, and they do a great job soaking up sauces. 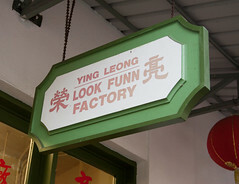 Here at the Ying Leong Look Funn Factory, you can see them being made. First of all, this place is seriously old school. Usually when you think “factory”, the idea is automation and machinery, but this place is basically pre-industrial, with hand labor doing most of the steps (about the exception is that they have an automated vibrating wire cutter to cut sheets of noodles into chow funn noodles if you want them that way). 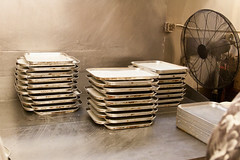 Nope, the process here starts with one worker oiling sheet pans (traditionally with peanut oil, but due to allergy concerns, they now use a canola mix), and then fresh noodle batter is ladled into each pan, swirled around, and then the pans stacked up in a giant steamer vessel. The lid is then lowered (with a pulley and a rope), and the noodles steam away, while they work on the previous round of noodles that just got pulled out of the steamer. Once the noodles are done, the vessel is opened, and a group of sheets are brought over to a table and put in front of big fans to cool, with the fans being one of the other few concessions to modernity. 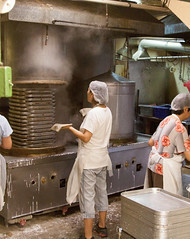 After each noodle sheet is dried and cooled, teams of workers roll up the flat noodles by hand, and stack them. It’s quite a process, but they do it for three different styles of funn: normal funn, and then two flavored varieties: one with chunks of shrimp, and another with chunks of char siu pork, with the bits mixed into the batter. It’s not really a restaurant (you can, however, order as little as one sheet of noodles, for around a dollar), so our hosts Sahara and Bill set up a little sample tray for us. 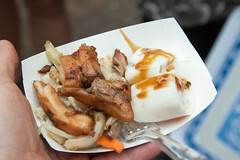 Each of us got samples of both the pork and shrimp noodles (at right), as well as a serving of chow funn with some freshly grilled chicken from Jackie’s Corner inside the Maunakea Marketplace nearby, which has a phenomenal food court representing most major Asian cuisines. In a word, these noodles were simply delicious. The chow funn noodles were toothy and flavorful, with just a little bit of stretchiness that made them the perfect match for the freshly-grilled chicken. I’ve always loved a good funn, but usually have to settle for either dried noodles, or frozen sheets from H-Mart. Having these fresh from the factory, just shortly after they were made, made for a great improvement on a already great dish. Overall, this was a great behind-the-scenes look at one of Chinatown’s gems: a noodle factory churning out sheet after sheet of fresh rice noodles. If I lived in Honolulu, this would be a regular stop for me, since the noodles are top-notch, and very cheap.